The Fayette County Memorial Hospital Foundation recently purchased two new pieces of equipment for various departments in the hospital. The Women’s Wellness Center received a mammography chair. The unit was ordered from Europe and will be very beneficial to patients who are unable to stand for long periods of time. Pictured (L to R): Front row: Kathy Dean- Foundation board member, Whitney Gentry- Foundation Director, Niko Hagler- FCMH Laboratory Leader, Dr. Norma Kirby- Foundation board member, Alicia Moody – FCMH Phlebotomy Section Manager, and Vanessa Blevins - Foundation board member. Back row foundation board members Rob Herron, Ron Ratliff, Mike Diener, Andrew Daniels and Roger Kirkpatrick. The second piece of equipment purchased was an AccuVein Vein Finder. The unit replaces the older model which was purchased by the FCMH Auxiliary. Mike Diener-FCMH CEO and Foundation board Member, Kathy Dean, Dr. Norma Kirby, Rob Herron, Ron Ratliff, Roger Kirkpatrick – Foundation board members, FMCH Robin Benson – FCMH Radiology Leader and Whitney Gentry – FCMH Foundation Director. 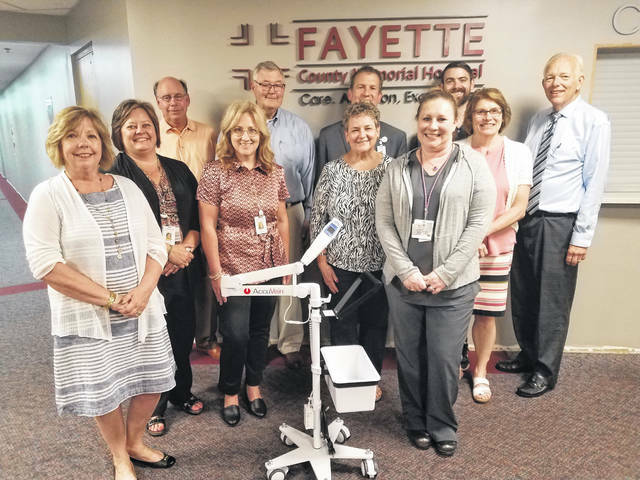 Fayette County Memorial Hospital (FCMH) Foundation purchased two pieces of equipment recently for various parts of the hospital. The Women’s Wellness Center received a mammography chair. The unit was ordered from Europe and will be very beneficial to patients who are unable to stand for long periods of time. “Positioning is very important when doing a mammography or biopsy and can be tedious, but with the chair we can position a patient and complete their procedure faster,” said radiology leader Robin Benson. The second piece of equipment purchased is an AccuVein Vein Finder. The unit replaces the older model which was purchased by the FCMH Auxiliary. The FCMH Foundation is a 501(c)3 established to not only ensure the hospital continues to provide premier care to patients but that it has to resources continue to expand on that care and capitalize on new advancements in medical care technology. The Foundation uses donations to support the hospital in enhancing patient care services, providing state-of-the-art equipment, contributing to expansion and renovation projects, supporting the development of community programs that will improve the health and well-being of people in the communities served by FCMH, and advancing healthcare education for the community. The Fayette County Memorial Hospital Foundation recently purchased two new pieces of equipment for various departments in the hospital. The Women’s Wellness Center received a mammography chair. The unit was ordered from Europe and will be very beneficial to patients who are unable to stand for long periods of time. Pictured (L to R): Front row: Kathy Dean- Foundation board member, Whitney Gentry- Foundation Director, Niko Hagler- FCMH Laboratory Leader, Dr. Norma Kirby- Foundation board member, Alicia Moody – FCMH Phlebotomy Section Manager, and Vanessa Blevins – Foundation board member. Back row foundation board members Rob Herron, Ron Ratliff, Mike Diener, Andrew Daniels and Roger Kirkpatrick. 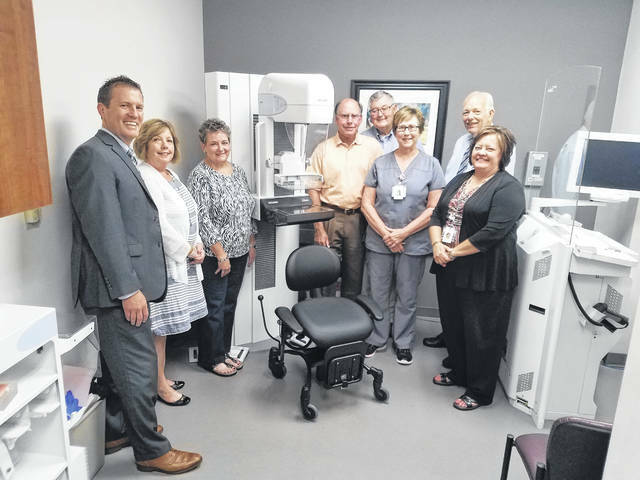 https://www.recordherald.com/wp-content/uploads/sites/27/2018/06/web1_20180613_172453.jpgThe Fayette County Memorial Hospital Foundation recently purchased two new pieces of equipment for various departments in the hospital. The Women’s Wellness Center received a mammography chair. The unit was ordered from Europe and will be very beneficial to patients who are unable to stand for long periods of time. Pictured (L to R): Front row: Kathy Dean- Foundation board member, Whitney Gentry- Foundation Director, Niko Hagler- FCMH Laboratory Leader, Dr. Norma Kirby- Foundation board member, Alicia Moody – FCMH Phlebotomy Section Manager, and Vanessa Blevins – Foundation board member. Back row foundation board members Rob Herron, Ron Ratliff, Mike Diener, Andrew Daniels and Roger Kirkpatrick. https://www.recordherald.com/wp-content/uploads/sites/27/2018/06/web1_20180613_173830.jpgThe second piece of equipment purchased was an AccuVein Vein Finder. The unit replaces the older model which was purchased by the FCMH Auxiliary. Mike Diener-FCMH CEO and Foundation board Member, Kathy Dean, Dr. Norma Kirby, Rob Herron, Ron Ratliff, Roger Kirkpatrick – Foundation board members, FMCH Robin Benson – FCMH Radiology Leader and Whitney Gentry – FCMH Foundation Director.